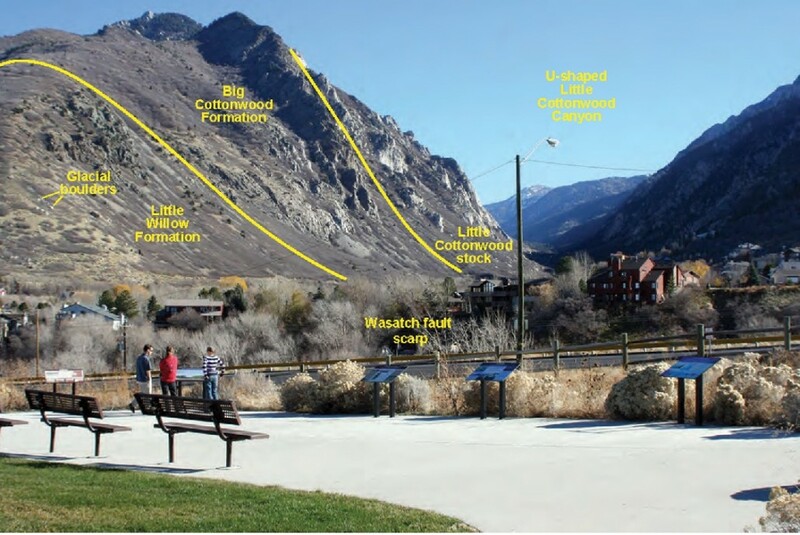 The boulder at the park entrance is quartz monzonite of the Little Cottonwood stock and was originally from the Temple Quarry in Little Cottonwood Canyon. The drill holes along the left side of the boulder were made in the late 1800s by quarry workers using sledge hammers and hand-held drill bits. 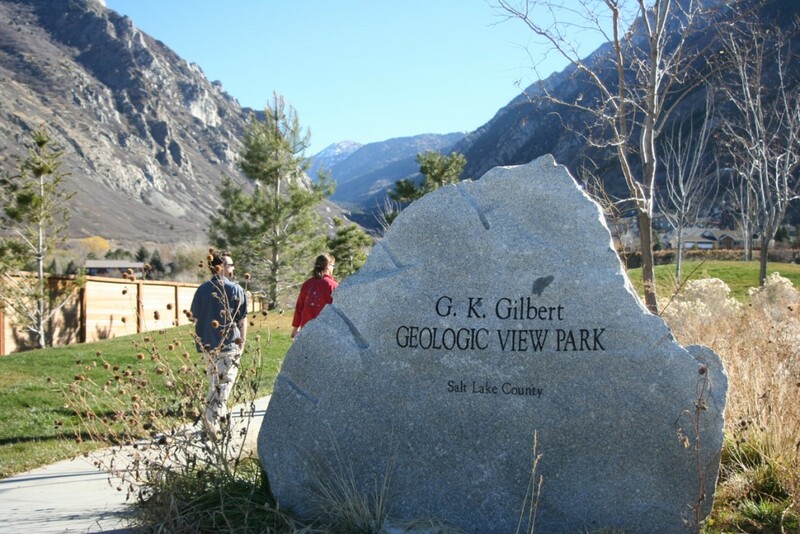 Located near the mouth of Little Cottonwood Canyon southeast of Salt Lake City, the park showcases several world-class examples of geologic features and has long been a destination for thousands of people on educational field trips. 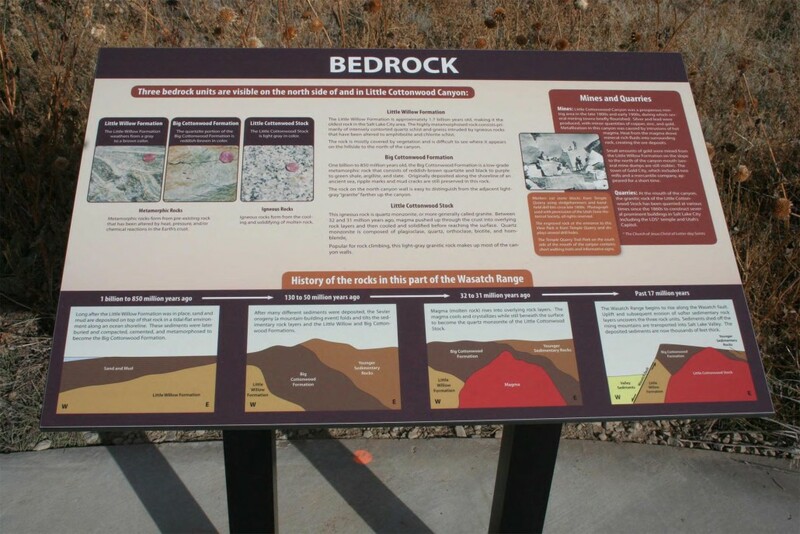 Five geologic interpretive signs were installed in November 2007 and park dedication took place on May 7, 2008 (see images to left). 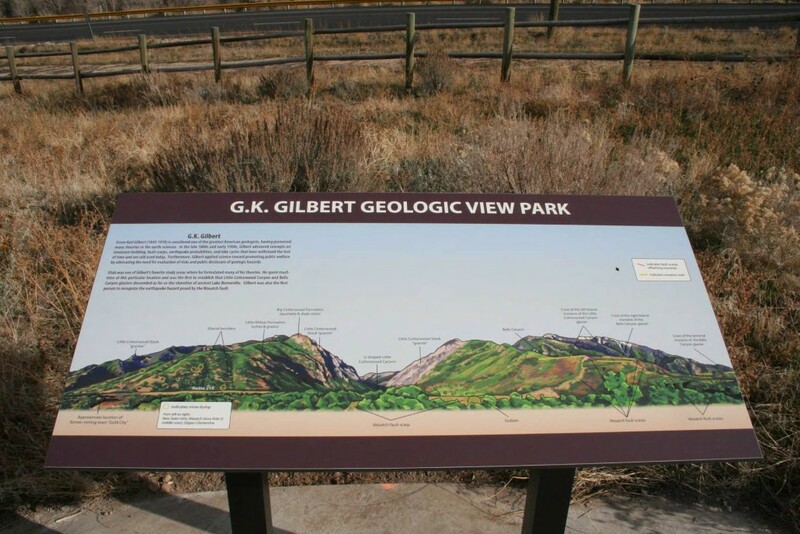 The interpretive signs provide information on a variety of geologic features that can be viewed from the park, including several rock formations in the Wasatch Range, scarps of the Wasatch fault, landforms and deposits associated with Ice Age glaciers, and evidence of past gold mining. 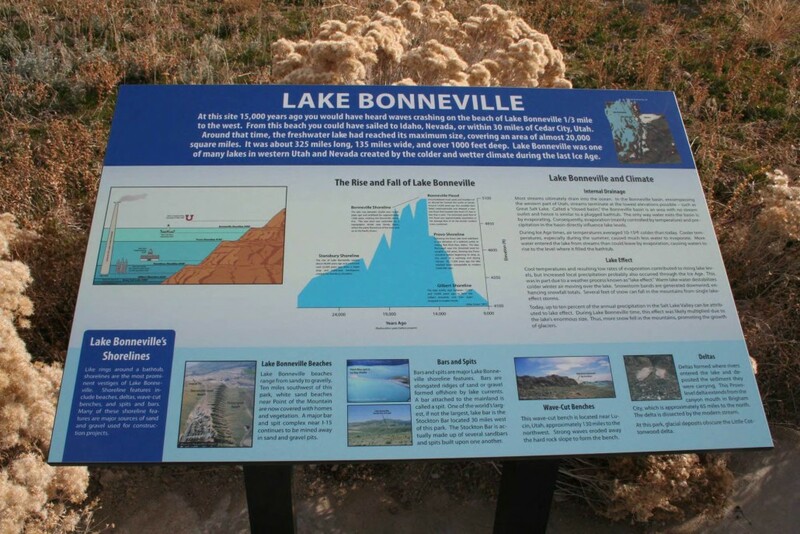 The signs also supply additional information about Lake Bonneville and past quarrying activities. 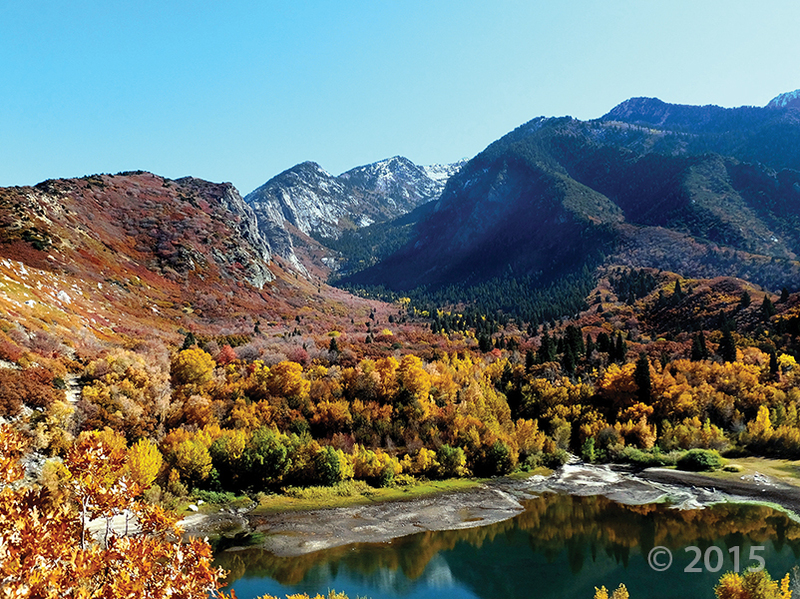 In the immediate vicinity of the park, the three visible rock formations are the metamorphic Little Willow and Big Cottonwood Formations and the igneous Little Cottonwood stock. The Little Willow Formation consists primarily of contorted quartz schist and gneiss; at 1.7 billion years old, it is the oldest rock in the Salt Lake City area. The Big Cottonwood Formation is a thick unit of alternating shale/slate and quartzite beds originally deposited in a tidal/shoreline environment 1 billion to 800 million years ago. In contrast, the Little Cottonwood stock is a relatively young 31-million-yearold intrusive igneous rock called quartz monzonite (generally known as granite). 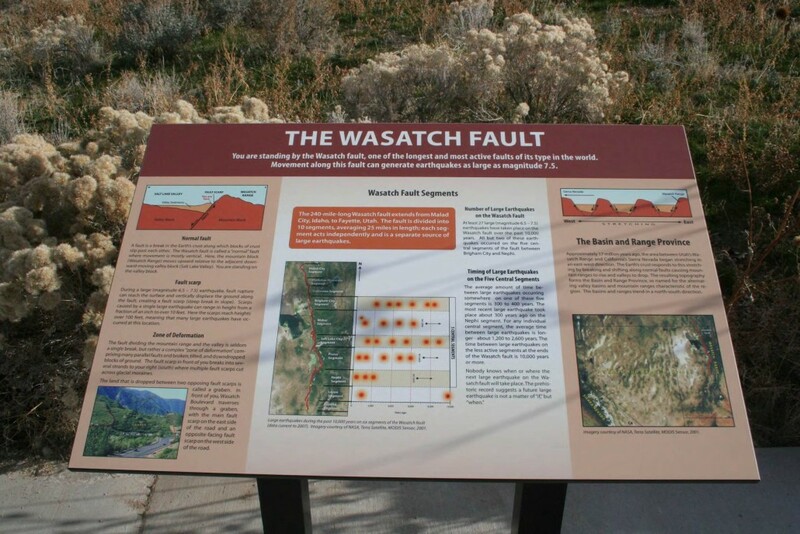 The Wasatch fault, Utah’s longest and most active fault, exhibits some of its largest fault scarps at this site. Reaching more than 100 feet high, these scarps formed during repeated large earthquakes that displaced the ground surface. This is one of only a few localities in the world where mid-latitude alpine glaciers met lakes during the last Ice Age 30,000 to 10,000 years ago. 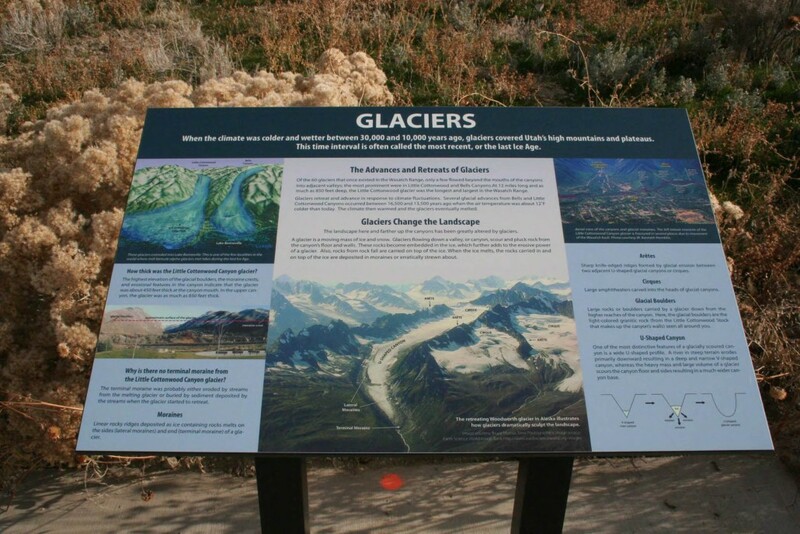 The glaciers in Little Cottonwood Canyon and Bells Canyon (to the immediate south) extended into Lake Bonneville, the Ice Age lake that covered much of western Utah. 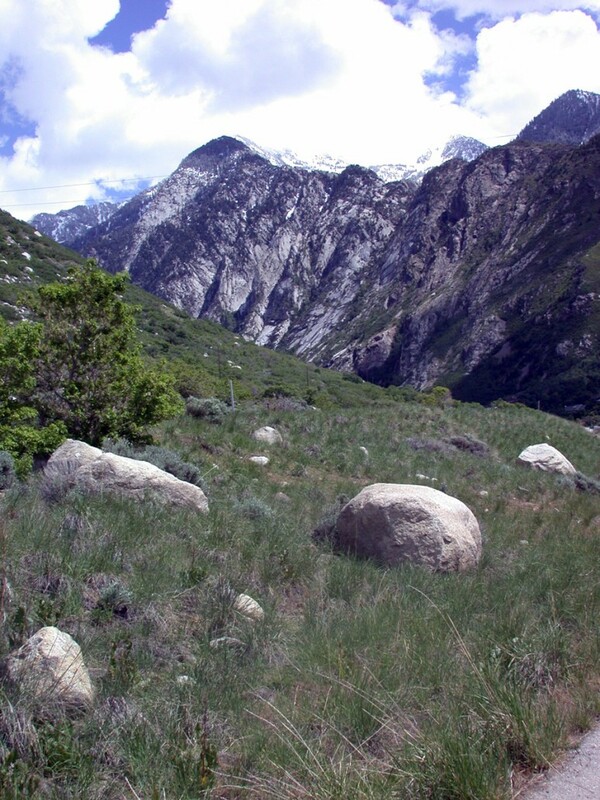 Glacial features at this site include the classic U-shaped canyon of Little Cottonwood Canyon (caused by glacial scouring), moraines, and scattered glacial boulders. More than a century ago, gold was mined in the Little Willow Formation, and mine dumps are evident near the canyon mouth where the former town of Gold City was located. Out of view in the lower canyon is the famed Temple Quarry, where granite of the Little Cottonwood stock has been quarried at various times since the 1860s to construct several prominent buildings in Salt Lake City. From I-15, take exit #304 onto I-80 East and after 5 miles bear right at exit #128 onto southbound I-215. Travel 5.9 miles, take exit #6 at 6200 South and turn left (east). Within 1 mile the road becomes Wasatch Boulevard near a gravel pit. Travel 1 more mile to a stoplight and continue straight (south). In 2.1 miles, turn right at a stoplight to continue on Wasatch Boulevard. In 1.1 miles is the junction with Little Cottonwood Road (9800 South); the park is northwest of this junction. Go right (west) to reach the park entrance. From I-15, take exit #291 and go east on UT-71/12300 South towards Draper. In 1.2 miles, the road becomes Draper Parkway. Continue 0.6 miles, then turn left (north) onto 1300 East. In 3.6 miles, turn right (east) onto UT-209/9400 South. 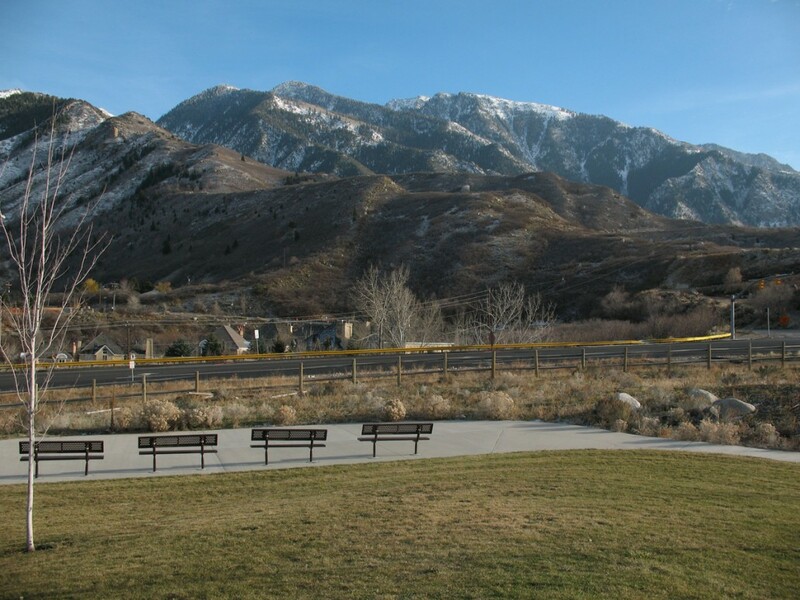 Travel 3 miles to the park entrance on the left (north) side of road just before the junction with Wasatch Boulevard.